Custom Made to Order Valentine Cocoon Set. Made with acrylic yarn. Wash on regular cycle low heat. 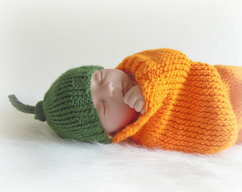 Beanie hat is newborn size. Cocoon measures approximately 18 1/2in long & 16in in circumference and fits the average 0-3mth baby (may fit up to the 4th month depending on baby size). This is a great item for newborn photos for all those Valentine babies or just to keep your little one snug & warm in the winter/early spring temps. Please take care to place your swaddled baby on his or her back and face up when putting down to sleep. Stop using the cocoon once your baby can roll onto his or her stomach as this may increase the risk of suffocation.